When using certain USB over CAT5 Extenders, such as those from Gefen or Crestron, with Zoom Rooms running on Mac OS X version 10.12 (10.12.4, 10.12.5 or 10.12.6 beta 4) and a Speakerphone, such as Revolabs UC-500 or Jabra 810, the audio received will sound distorted. We are working closely with Apple and the associated vendors to address this bug. Once an update is available from Apple or the impacted vendors, we will update this article accordingly. Until an official fix is available, the following mitigation options are available. For users of the Revolabs UC-500 or other Revolabs products, the following procedure may correct the issue. 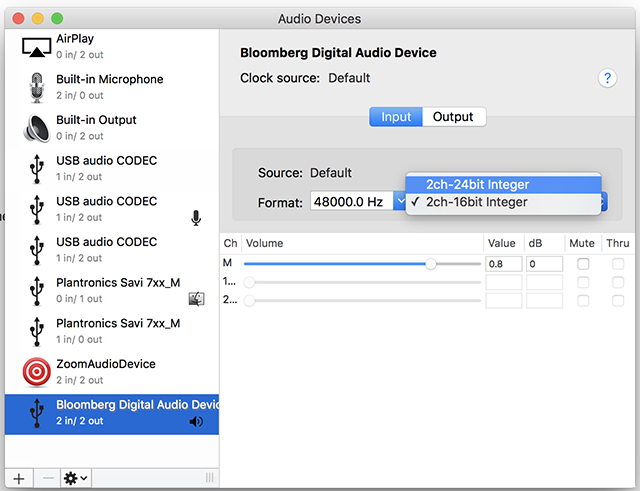 Launch the Audio Midi Setup program located with the Utilities folder within the Mac application list. Select the Revolabs device from the list on the left hand side of the screen. Change the Format to 24bit. Mac OS X version 10.11 and prior not appear to be impacted by this issue. Please refrain from upgrading to Mac OS X version 10.12 until this issue is resolved.